Pick a custom laminate desktop to match your office decor and personal style. Need help or want more customization? Give us a call! L-shaped desks arrive in two pieces. Measure your office, and choose a length that will fit your workspace and style! Decide which direction you want to face in the room. We advise choosing an extension on the same side as your writing hand. Pick a frame color that goes well with your desktop style and office accents. We offer accessories that match your frame color. Route and tame your cables around your desk with this Magnetic Cable Organizing Channel, which attaches to your desk frame in a snap! Our best-value Large and Switch Keyboard Trays are sturdy, easy to adjust, and let you type in an ideal posture, with your keyboard above your lap. As your sit-stand desk raises and lowers, your wires go with it. Power grommets provide convenient power right on your desktop. Acoustic panels greatly reduce noise in open office layouts and loud workspaces. They also help you focus by boosting privacy at your desk! The perfect blend of privacy and wire management, modesty panels block the view under your desk and let you hide your cords within its mesh pouch. Easily move your desk with locking standard or heavy duty casters. It makes optimizing and organizing your office easier than ever! We advise switching between sitting and standing every few hours. Our selection of chairs is approved by our Certified Professional Ergonomist. To avoid pulling wires when you adjust your desk, we recommend placing your computer in a CPU holder. This also gives you easy access to ports. Standing desks are designed to help you move! Pick the active mat to comfortably stand, stretch, and shift positions throughout the work day. Tidy up your area with some storage. Keep office supplies organized or personal items secured in a locking under-desk drawer. Footrests improve circulation and support feet while sitting. It also helps users less than 5' 4" keep their feet grounded when seated in ergonomic chairs. We recommend upgrading to the advanced keypad to add one-touch adjustment, a digital height display, and four memory settings. Work is better and more productive in the right light. From desk lights to floor lamps, we have many lighting options for you. Monitor arms let you pose your monitors at the ideal viewing level, preventing neck strain. They also lift your screens off your desk, saving space. Move more for even greater health benefits! Balance, stand, and rock while you work with a motion board underfoot. Work with easy-to-reach power that's conveniently situated on your desk with the Clamp-on Surge Protector and Clamp-on Power with USB. This holiday season, enjoy a few more accessories to furnish your new desk or to gift a lucky coworker - totally free! Turn down the volume of coworkers and give yourself even more privacy at your desk with a few side panels. We advise adding side modesty panels if you want additional privacy and wire management on the sides of your desk. Side tables clear off desktop space and match your new desk. Keep printers, supplies, and personal items in their own spot and off your work area. Install some storage with a filing cabinet. It's fully assembled and ready to help you clear off desk clutter and stay organized. Walk or pedal for at work for even greater health benefits. Choose a treadmill based on how much you plan to walk or the bike if you prefer to cycle. Every UPLIFT frame comes standard with an industry-leading 7-year warranty. Call, email, or chat - we're here to help you! Tired of the tangle of wires behind your workstation? Organize them with a wire management kit that moves in tandem with your desk! Choose from a variety of high quality, GREENGUARD-certified laminate colors. The UPLIFT L-Shaped Laminate Desktop is 30" deep and available in a variety of different widths: 60", 66", 72", 78" and 84". For maximum protection during shipment, the desktop for your UPLIFT Height Adjustable Standing Desk with L-Shaped Custom Laminate Desktop will arrive in two pieces: an offset L-shape with a small extension piece. Once it is assembled, the desktop is an equal corner desktop, but you can choose whether you want the small extension piece on your left or right side as you are seated at the desk. Choose from four frame color options: black, gray, white, and now metallic (industrial style). The frame has a generous height range of 24.5'' - 50.25'' (not including desktop thickness) and lifts up to 530 lbs. A note about metallic (industrial style) frames: Metallic (Industrial Style) frames are designed to have an industrial aesthetic. This intentionally imperfect finish allows the character of the raw steel legs and aluminum feet to show through, so no two frames will look exactly alike. If you prefer a uniform finish, we suggest the black, gray, or white frames, which are powder-coated for a more consistent look. Finding the right height preferences for you at your new adjustable height desk can be revitalizing. Another benefit of using a standing desk is the ability to sit in a more ergo-friendly position for your body, ideally with your keyboard and mouse on your lap or within your Neutral Reach Zone. This is different for everyone, but UPLIFT's height range of 24.5'' - 50.25'' means that it will work for 99% of the population! Not all electric standing desks are created equal. Where most of our competitors offer 2-stage frames standard or "extended range" 3-stage desks for a premium, we offer only the strongest, most reliable, quickest adjusting, and quietest in ergonomic adjustable height desk bases with our 3-stage UPLIFT Desk frame. 2-stage frame legs are made with just two parts, which limits the base's movement range. They are also slower to raise and lower - 33% slower to be exact. Our 3-stage frames come with three small spindles in each leg versus the standard two, letting you reach your sitting and standing preferences quicker, and giving you a better overall experience when working at your desk. Since 2-stage frames have a narrower range of height adjustability, its lowest height setting does not reach a spot that places the keyboard tray at an ergonomically correct height for you. The frame's upper height is also reduced, meaning taller users may not find these 2-stage frames suitable for them. Desks with 2-stage frames also lack the ability to add a treadmill to your work setup later on, meaning your desk will have fewer options when adapting in the future. 3-stage frames allow you more freedom to adjust higher, lower, and add ergonomic accessories to your workstation. 2-stage frames come with a single motor that it relies on to adjust the desk's height. Our 3-stage frames boast powerful motors in each leg, which give you the stability you need to safely raise and lower your desktop for years of comfortable work. If you want a desk with lifting capacity to reliably support your desktop and all its gear, a 3-stage frame will deliver a higher weight limit than 2-stage frames. More susceptible to overloading and breaking, single motor and 2-stage frames simply do not offer the same strength when adjusting versus a 3-stage frame. Safety reverse sensing is not included on standard 2-stage frames, meaning that desk accidents are likely to happen if you raise or lower your desk with things in the way. For a safer desk, go with a 3-stage frame. Factor in louder motors on 2-stage frames and you'll start to wonder if our competitors' desks allow you to get any work done at all. Invest in a desk that delivers all of the ergonomic features you'd want in a workstation with UPLIFT Desk. An ergonomic keyboard tray gives you the freedom to adjust the height and tilt of your keyboard independently from the desk and also relieves the strain caused by overreaching when typing. The Large Keyboard Tray by UPLIFT Desk comes with one, 27'' wide surface, which lets your keyboard and mouse sit side by side. Thanks to a sturdy, easy-to-adjust mechanism, you'll have a desk accessory that allows you to customize your keyboard's position, improving health and comfort at work simultaneously. For those who prefer more flexibility, the Switch Keyboard Tray by UPLIFT Desk comes with two surfaces: a 19.5'' wide platform for the keyboard and a separate 9'' diameter surface for your mouse pad and mouse. The mousing platform can easily slide to the left or right side of the platform in seconds for ambidextrous mousing, letting you switch hands for even more comfort. This keyboard tray is also depth adjustable and boasts a sturdy mechanism that puts you in control of your keyboard's tilt. The E3 Keyboard Tray by UPLIFT Desk provides space for both your keyboard and mouse on a single surface. This budget-friendly tray comes with the essential adjustment features, including positive and negative tilt and the ability to lower the tray a full 4.33 inches below the surface of your desk by manipulating a lever located on the tray's mechanism. Unlike the Large and Switch trays, the E3 has no above-desk height adjustment, a reduced tilt adjustment range, and a lever-controlled lifting mechanism instead of the more intuitive lift-and-release mechanism found on our other keyboard trays. Add an UPLIFT Track Spacer to either keyboard tray to allow you to mount the track over the center crossbar rails on your desk, allowing for better desktop support on wide desktops and full keyboard tray retraction on 24'' deep desktops. The Acoustic Privacy Panel by UPLIFT Desk is available in multiple sizes to fit the back of your UPLIFT L-Shaped Desk. Choose between blue, dark gray, or light gray for your Acoustic Privacy Panel. The polyester dense fiber board will dampen the background noise in your office to allow your focus to go to your work. The panel is also tackable so you can pin pictures or memos to the board. The Acoustic Privacy Panel Mounting Hardware by UPLIFT Desk is made to fit desks up to 1.75" in thickness. The mounting hardware comes in black, gray, or white to match the UPLIFT frame color. Installing Acoustic Privacy Panels to your desk is easy. Start by sliding the pegs of the support brackets through the holes in the privacy panel. From the other side, attach to two clamp brackets with a set of flat-head screws. To secure to your desk, loosen the clamp brackets, situate them where you want them on your desk, and tighten the clamps. The Desktop Acoustic Privacy Holder by UPLIFT Desk allows you to set the Back Acoustic Privacy Panel directly on your desktop. Choose between a black, gray, or white powder-coated finish. Create partitions between workspaces that can be moved, as needed. Installation is as easy as sliding the panel into the slot. The Desktop Holder also comes with additional storage compartment for small office tools such as a stapler or post-it notes. Add the Acoustic Privacy Panel to one or both sides of your UPLIFT L-Shaped Desk. The panel is available in multiple sizes to fit the extension side of your corner desk. Choose between blue, dark gray, or light gray for your Acoustic Privacy Panel. Order all of your acoustic panels in the same color, or mix it up by choosing a different color for each panel. The polyester dense fiber board will dampen the background noise in your office to allow your focus to go to your work. The panel is also tackable so you can pin pictures or memos to the board. Attach the Side Acoustic Privacy Panel to your desk with a clamp mount that is compatible with desks up to 1.75" thick. The Acoustic Privacy Panel Mounting Hardware by UPLIFT Desk comes in black, gray, or white to match the UPLIFT frame color. The Desktop Acoustic Privacy Holder by UPLIFT Desk allows you to set the Side Acoustic Privacy Panel directly on your desktop. Choose between a black, gray, or white powder-coated finish. Adding an Modesty Panel with Wire Management will give your UPLIFT Desk's minimalist design an extra level of privacy. This modesty panel easily attaches to your desktop, traveling with it as you move from sitting to standing height, and features a mesh pocket for convenient wire management. The UPLIFT Modesty Panel, available at a discount when bundled with your desk, will help increase under-desk privacy while maintaining your desk's clean, open design. It is available in different lengths to correspond to your desktop. We also offer a partial modesty panel that is 42 inches wide. This panel size is a great choice if you are looking for help managing the wires under your desk along with some privacy coverage. Below you will find the recommended UPLIFT Modesty Panel with Wire Management configurations for the UPLIFT L-Shaped Laminate Desk. If you choose a different size to go with your desk, we cannot guarantee that the modesty panel will fit properly. Choose to add the Modesty Panel with Wire Management to one or both sides of your UPLIFT L-Shaped Desk. The configurations shown below will help you visualize the layout of the panels for each desk size. If you choose a different size to go with your desk, we cannot guarantee that the modesty panel will fit properly. The UPLIFT Desk can be ordered with optional casters in black or white. Desk Casters come in a set of four - two for each leg. They can be locked to keep the desk stationary, but are easily unlocked when you need to roll the desk. Desk Casters are a great option for those who don't want to be tied down by a desk that is too big to move. These sturdy casters will roll across hard surfaces or low pile carpet. They also add extra height to your desk to accommodate a treadmill or users over 6'6" tall. Please note: the casters will add approximately 2" of height to your desk. Whether you need to roll your desk over uneven warehouse flooring, or just want heavy duty support for the tangle of computer wires on the floor, Heavy Duty Locking Casters by UPLIFT Desk add the ease of rugged mobility to your sit-stand desk. When the job requires mobility, roll your desk over uneven flooring, cables, or debris without breaking a sweat, or your desk. These casters boast an impressive 4-inch diameter and are constructed with stainless steel, molded black plastic, and rubber. Once you have reached your final destination, just lock your desk in place using the foot-activated locking mechanism on each caster. Please note: the heavy duty casters will add approximately 5" of height to your desk. The UPLIFT Pursuit Ergonomic Chair offers the adjustments of a high-end office chair at an UPLIFT price you can appreciate. This sleek chair comes in black and white color choices and is jam-packed with options: seat tilt tension control, adjustable lumbar support, height and swivel adjustable arms, backrest angle adjustment, and an adjustable headrest. The J3 Ergonomic Chair by UPLIFT Desk combines the cool support of a mesh backrest with a contoured leather seat. We've got you supported from head-to-toe with adjustable armrests, headrest, seat height, and seat depth. The responsive lumbar support and cutting edge design makes the J3 Ergonomic Chair a great choice for most body types. Sit back and enjoy working at your UPLIFT Desk in the J3 Ergonomic Chair. The Vert Ergonomic Office Chair When you're looking for a chair that really gets to know you, look no further than the Vert Ergonomic Office Chair. Enjoy intuitive adjustments and height adjustable lumbar support that allows you to work in more comfort than ever before. The Ergonomic Kneeling Chair by UPLIFT Desk eases lower back pain, boosts circulation, and improves energy levels by gently encouraging you to sit in the proper posture, simultaneously strengthening muscles throughout your entire body. In addition, this chair helps to properly align your back, shoulders, and neck, for more comfortable seating that assists you in working better. Pick from Gray or Blue color options on the Ergonomic Kneeling Chair's upholstered seat and knee cushions. The E7 Stool by UPLIFT Desk offers a resting perch while you toggle between sitting and standing. Tilt, rotate, and pivot in comfort on a padded seat that is both breathable and stain-resistant. The backrest also doubles as a handle for portability. The Starling Stool by UPLIFT Desk is a lightweight active stool that promotes movement and minimizes distraction. It tilts to a total of 10 degrees, while still offering 360 degrees of rotation and height adjustment from seated to perched heights. Need to move it? Grab the convenient handle behind the seat and you're on your way! Get your stool in Myrtle Green, Blue, Orange, Gray, or Brown fabric colors. The UPLIFT Motion Stool gives you the option to sit, lean, or perch. It supports you through a wide range of movements, keeps you stable, engages your core, and promotes activity. Perch-sitting provides an optimal hip angle, encouraging comfort and healthy posture. Sit and perch comfortably on top of the E3 Crescent Saddle Stool by UPLIFT Desk and start moving more at your workstation. The cushion can be oriented into two different positions, which allows you to sit in traditional or straddled postures. Choose from turquoise, green, or orange upholstered seats. The E3 Donut Stool by UPLIFT Desk will encourage you to move more while you're at work. The rounded 360 degree swivel seat has a signature center dip, perfectly placed to help alleviate pressure on your tailbone as you sit. And with a pivot point just underneath the stool’s seat, you’ll feel free to tilt and rock in every direction, stimulating your core as you work, and boosting your focus and satisfaction. The E3 Donut Stool comes with a black base and your choice of two fabric color choices: red or gray. The award-winning Steelcase Amia Chair provides unsurpassed functionality for users of all sizes. The Amia chair is offered here with standard black fabric, a black frame and some of the most adjustable armrests on the market. You can rest assured that you will love your Amia Chair or get your money back with Steelcase's 30-day satisfaction guarantee. The Steelcase Think Chair provides exceptional ergonomic adjustability wrapped in a modern package. Steelcase's LiveBack support system adjusts to your body as you move throughout the day. The Think Chair is available here with standard black fabric, a black frame and adjustable armrests, and is backed by Steelcase's 30-day satisfaction guarantee. The Steelcase Leap Chair also features Steelcase's LiveBack technology, which supports your back as you move. The seat on the Leap Chair will glide forward as you recline your chair, a handy feature if you enjoy working in a reclined position. As with the other Steelcase chairs, the Leap Chair is available here with standard black fabric, a black frame and adjustable armrests, and is backed by Steelcase's 30-day satisfaction guarantee. The Steelcase Gesture Chair was designed for users who frequently use gadgets such as tablets, smartphones or laptops, which aren't always conducive to the best posture. Featuring Steelcase's LiveBack technology and arms with 360° swivel arms, the Gesture Chair is highly adjustable. The Gesture Chair is available here with standard black fabric, a black frame and adjustable armrests, and is backed by Steelcase's 30-day satisfaction guarantee. When using a sit-stand desk, we recommend mounting your computer beneath your desktop to prevent cables from being stretched and pulled out of their ports when moving the desk from sitting to standing positions. The CPU Holder by UPLIFT Desk allows you to securely attach your computer tower to the bottom of your desktop to free up desk space. The E3 CPU Holder by UPLIFT Desk provides functional CPU storage at an economical price point. Get your computer tower off the floor, where it is currently gathering dust, and enjoy the freedom of being able to move your UPLIFT desk up and down without worrying about yanking out a cord in the process. The E3 CPU Holder is a great choice for a lightweight tower, and it comes in three color choices - black, gray, and white! Check out the CPU Holder Comparison Chart below to decide which CPU Holder meets your needs. The UPLIFT Standing Desk Mat is an excellent choice for comfortable standing. It has a textured surface to prevent slipping, and the gel foam interior provides relief to legs and feet. It's light and small enough to easily move back and forth as you go from sitting to standing. You are already choosing a healthier lifestyle by adding a standing desk to your workspace. Why not go the extra mile and incorporate the E7 Active Anti-Fatigue Mat by UPLIFT Desk, as well. This active standing mat lives up to its name by providing many ways to stretch and exercise at your desk. Massage your feet on multiple textured surfaces. Stand on the power wedge to stretch your calf muscles. Use the mounds to engage your leg muscles and exercise while you work. Stand up and move more with the support of the E7 Active Anti-Fatigue Mat by UPLIFT Desk. Take a journey around the E7 Small Active Anti-Fatigue Mat and feel the difference active standing can have on your body. This compact, comfortable, and supportive standing mat features a multidimensional terrain that lets you target tired muscles, perfect for long days spent in the office. The mat's high-density core takes pressure off your legs, knees, and feet, for more comprehensive support from the ground up. For a little bit of extra storage, add a Large Half Circle Desk Drawer by UPLIFT Desk at a discounted price when bundled together with your desk. This half-circle-shaped, swiveling drawer easily attaches to the underside of your desktop via a central mount and pivots in either direction, rotating out to give you quick and easy access to smaller accessories that you don't want cluttering up your desktop. Featuring pen and pencil trays, a notepad slot, and storage compartments, the 13.6" W x 7.4" D x 1.3" thick UPLIFT accessories drawer will help keep your height adjustable desk cleaner and more organized. Or save a little space on your desktop by storing your smaller personal effects in the Small Half Circle Desk Drawer by UPLIFT Desk. Featuring a similar design to its sister drawer, the Small Drawer is sized to hold notes, pens, and even sunglasses within its single inner compartment. This 7.9" W x 7.5" D x 1.2" thick UPLIFT accessories drawer allows you to clean up desk clutter and store it all simply and stylishly. Both drawers come in your choice of black and white color options to coordinate with your desk and decor. Lock up your desk goodies so that you won't have to worry when you step away from your desk. The Locking Under Desk Drawer by UPLIFT Desk provides a secure drawer and a padded shelf, for added storage on your UPLIFT Desk. Store your purse, laptop, or top-secret documents out-of-sight with ease-of-mind. The Locking Under Desk Drawer by UPLIFT Desk is available in three powder coated color choices - black, gray, and white. Free up more space on your desktop by adding the Hanging Storage Cubby by UPLIFT Desk. This large, under-desk storage solution comes in black, white, and gray to match your UPLIFT Desk frame. Sturdy steel construction will keep your books, binders, or a laptop secure. Plus, there is no need to worry about scratching your valuables thanks to the padded shelves on top and bottom. The Hanging Storage Cubby requires no installation. Take it out of the box, slide it onto the front edge of your desk, and get to organizing your things! Increase the storage capabilities of your desk without adding bulk with the Slim Under Desk Storage Drawer by UPLIFT Desk. This steel, locking drawer comes in a black, gray, or white powder-coated paint finish. Mount the drawer to the underside of your desk by using four wood screws to hold it in place. Optional brackets are included for the ability to add a shelf above the locking drawer. Lock away your valuables for peace of mind while you are away from your desk with the Slim Under Desk Storage Drawer. The E3 Adjustable Footrest by UPLIFT Desk is a great addition to a sit-stand workspace because it provides angled support to bring your body into better alignment. Flip up the two adjustable legs to four different positions of tilt: 6, 12, 16, and 25 degrees. The top surface of the E3 Adjustable Footrest is covered in grooved rubber for a non-slip surface for your feet. Petite users will find that the addition of an ergonomic adjustable footrest allows them to sit more comfortably in a standard-height chair or stool. UPLIFT Desk frames come standard with a basic Push and Hold Two Button Up/Down Keypad, or you can upgrade to the Advanced 1-Touch Keypad with 4 Memory Positions and Digital Height Display. Its digital readout allows you to make precision adjustments to get your frame to exactly the height you need, then auto-dims to save power. Once you find the perfect sitting and standing heights, four programmable memory presets allow you to save those and then return to them with just one touch of a button. Get all of the customization options you want in one streamlined little package. The E3 LED Desk Lamp has 5 different levels of brightness and unlimited control over your color temperature. Use the buttonless touchpads on the base to set the levels that are right for your room at that moment. The Illuminate™ LED Task Light by UPLIFT Desk offers cool, warm, and natural light in five levels of brightness. Illuminate what you are working on at your desk with the rotating and swiveling head. This sleek task light will reduce eye strain felt from staring at a computer screen all day in suboptimal lighting conditions. The Illuminate multi-tasks like a boss, with a USB port located in the base that allows you to power and charge your peripheral devices. Take the lighting in your office up a notch with the E7 Desk Lamp with Clamp by UPLIFT Desk. This desk lamp is available in three colors - black, white, and blue - and attaches to your desk with a clamp. The clamp attachment makes it easy to secure your desk lamp to the edge of your desktop or through a grommet hole. If a clamp-mount isn't what you are looking for, try one of the optional bases. The desk base or floor base will turn the clamp lamp into a more traditional lamp. To attach, just remove the clamp and insert the lamp into the desk base or floor base. Easing eye strain has never been so easy with the E7 Desk Lamp with Clamp by UPLIFT Desk. The UPLIFT Range Monitor Arm is a pneumatic arm that provides complete fingertip adjustment for height, depth and lateral movement with an adjustable counterbalance system. If you need a dual monitor solution, you can choose two single UPLIFT Range Arms, or an UPLIFT Dual Monitor Arm. Add an UPLIFT Laptop Mount to raise your laptop to a more comfortable viewing height. The UPLIFT View monitor arm comes in a single monitor option, to keep your display at the perfect height. With integrated cable management, a generous weight range, and two built-in USB ports located conveniently in the base, View is an all-in-one monitor mounting solution. Add an UPLIFT View Laptop Mount to raise your laptop to a more comfortable viewing height. The UPLIFT Horizon Monitor Arm provides pneumatic height adjustments for heavy monitors over 9 lbs, via a built-in gas cylinder located in the arm. Enjoy the freedom to rotate, tilt, pan, and adjust to your most comfortable working levels with the touch of a finger. Dual monitor setups that need a little elevation will be pleased to know about the height adjustability offered by the UPLIFT Horizon Dual Monitor Arm. Position your screens independently of each other, rotate, pan, and tilt to the best spots for you in seconds. The UPLIFT Horizon Dual Monitor arm is compatible with heavy monitors over 9 lbs. Weight Capacity (per arm) 4.5-17.5 lbs 4.4-19.8 lbs 9-18.7 lbs. (to center of VESA mount) Single: 5.25" to 19.5"
Dual: 5.75" to 21.25" Single: 5" to 16.5"
Dual: 5.75" to 16.25" Single: 6.5" to 16"
Move even more at work with the E7 Motion Board by UPLIFT Desk. 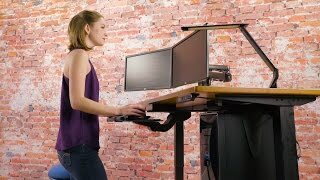 Stand, rock, and tilt your way to a more active workday with this companion to your standing workspace. The luxurious, faux leather pad reduces the fatigue of standing by cushioning your feet and legs. The curved bottom of the motion board facilitates gentle, balanced movement while standing. Standing suddenly became more enjoyable with the added motion of the E7 Motion Board. Please note: Heels should not be worn while standing on the E7 Motion Board. Please note: Heels should not be worn while standing on the Bamboo Motion-X Board. Convenience is the name of the game with the Fit Motion Board. From the moment you pull it out using the convenient heel grab feature, you'll enjoy the board's user-friendly design. The surface includes felt padding, which adds traction and makes the board as soft to stand on as a desk mat. And if the tilt is too excessive, optional bumpers may be attached underneath to make using the board a more casual experience. Please note: Heels and other unstable shoes should not be worn while using the Fit Motion Board. When you spend this much time at your sit-stand desk, it helps to not only have power within easy reach, but power that travels with you as you raise and lower your workstation throughout the day. With our desk-ready power solutions, you can have both in power units that install directly to your desk, which prevent cords from snagging and pulling. Work with the perfect combination of power and surge protection with the Clamp-on Surge Protector with USB Charger by UPLIFT Desk. Or add dual power and dual USB ports to your desk's edge with the Clamp-on Power with USB. Both offer convenient power in sleek designs that attach to your workstation, and can be paired with all of our wire management options. Add an UPLIFT Standing Desk Mat for FREE when you buy a full UPLIFT Desk! Our 18" x 30" anti-fatigue mat has a gel foam core, providing comfort and support while you're standing at your UPLIFT Desk, and it's lightweight and easy to move aside when it's time to sit down. The E7 Active Anti-Fatigue Mat by UPLIFT Desk offers a dynamic standing experience. Reduce pressure in the legs and feet as you stand in place on the cushioned polyurethane foam. Or kick things up a notch with multiple support surfaces designed to relieve pressure, stretch, and massage the feet. The E7 Active Anti-Fatigue Mat is offered at a steeper discount when combined with the promotional Desk Organizer Set. Eco-friendly and eye-catching, you'll love organizing your desk with the Bamboo Desk Organizer Set. It comes complete with a large box, a medium box, a small box, a 4" x 6" picture frame, a business card holder, a phone holder, a pen holder, and a matching ballpoint pen with blue ink. Clean up your workstation with a coordinated desk set made from genuine bamboo. Add a splash of color to your desk while getting your ducks in a row with the colorful Desk Organizer Set by UPLIFT Desk. Choose between five colors - aqua, blush, blue, gray, and white - all available in a matte finish. The set includes a large paper tray, medium box, small divided box, pen holder, business card holder, and six gray gel pens with blue ink. An organized desk never looked so fun, until now. Add an UPLIFT 4-Port 3.0 USB Hub for FREE when you buy a full UPLIFT Desk! This will allow you to connect up to four extra USB devices to your computer. It also allows for lightning fast data transfer, which will save you the time and hassle of switching out devices because you don't have enough USB ports. Save a little space on your desktop by storing your smaller personal effects in the Small Half Circle Desk Drawer by UPLIFT Desk. The Small Drawer is sized to hold notes, pens, and even sunglasses within its single inner compartment. This 7.9" W x 7.5" D x 1.2" thick UPLIFT accessories drawer allows you to clean up desk clutter and store it all simply and stylishly. Add a pair of UPLIFT Under Desk Accessory Hooks for FREE when you buy a full UPLIFT Desk! Use them to hang bags, headphones, keys, or anything else you want to keep handy. Or turn them into a versatile wire management solution! Add one or two Side Panels to your desktop for additional privacy and sound reduction. The Side Acoustic Privacy Panel comes in blue, dark gray, or light gray to match the back panel, or mix and match to create a personalized look! Add the Side Modesty Panel with Wire Management to one or both sides of your UPLIFT L-Shaped Desk. The left and right-sided panels are interchangeable, so you can easily reconfigure your desk in the future. The integrated mesh pocket provides an additional avenue for cable management. Add the 2-Leg Side Table to your UPLIFT Desk for extra storage or work space. The Side Table is available in the same frame color and desktop style chosen for your UPLIFT Desk. The only decision you need to make is what size will best fit your space. This fixed height side table will complete the cohesive look of your office. While a stand-up desk is great for your primary workspace, a side table can be used for your printer, books, or anything else you need nearby, but don't necessarily need to be able to stand up to use. The 2-Drawer File Cabinet with Seat, Rolling by UPLIFT Desk fits comfortably under your desk and provides storage or an extra place to sit. The large bottom drawer can be used for hanging files while the smaller drawer on top is great for storing odds-and-ends. Lock the cabinet for peace of mind when you are away from your desk. Available in a black, white, or gray powder-coated finish. Now available in a metallic (industrial style) finish as well! Storage takes a sleek turn with the rolling 3-Drawer File Cabinet, Rolling by UPLIFT Desk. With three drawers and casters for added mobility, this file cabinet gives you the additional storage you need to clean up your workspace. It is available in three color choices: black, white, and gray. Close the top drawer without disturbing your neighbors with the soft-close gliding mechanism. Organize your small knick-knacks with a removable tray that can be placed in the top drawers, while still allowing for storage underneath. Lock all three drawers simultaneously when you need to protect your work or valuables. Storage meets seating with the Narrow 2-Drawer File Cabinet with Seat, Rolling by UPLIFT Desk. This slimmer filing cabinet is a great storage option if you have limited space underneath your desk. Two locking drawers provide room for small to medium sized items, including letter or legal-sized files. The Narrow 2-Drawer File Cabinet is available in black, white, or gray to match the UPLIFT Desk frame and accessories lineup. Pull out the cabinet to use as a seat for a coworker, or prop up your feet after a long day of standing. This slim cabinet is the multi-functional storage accessory needed to complete your standing desk setup. To take your office storage to a whole new level, look no further than the Slide Out Office Storage Cabinet by UPLIFT Desk. This large storage compartment features a single door that slides out to reveal two right or left facing drawers. A grommet hole conveniently placed in the back of the cabinet allows you to route power cables or other wires through the cabinet. Available in both white and black, this large storage solution is just what you've been looking for to finally meet that New Year's resolution of an organized workspace. For those who get bored with walking or standing at your desk, take the LifeSpan Solo Under Desk Bike for a spin. This under desk bike is powered by you, so it lacks any cords that would get in the way. Casters offer portability, making it easy to move the bike under your desk when not in use. The oversized pedals, waterfall seat cushion, and back support provide plenty of comfort when you want to go the distance. Leave your bike at home and pedal your way to a healthier you with the LifeSpan Solo Under Desk Bike. Slowly pedaling forward or backward at your desk can increase the blood flow in your legs without forcing you to break a sweat or break your concentration on the task at hand. Maximize your focus and energy at your workstation by adding a LifeSpan treadmill to your UPLIFT Desk! Choose from one of the following three LifeSpan Treadmill models: TR800-DT3, TR1200-DT3, or TR5000-DT3. We are so confident in our product that we back each UPLIFT frame we ship with a 7-year warranty, which covers the frame, motor, controller, keypad, electronics and mechanisms. You also have the option of upgrading to our 12-year, all-inclusive extended warranty. If you have any issues with your frame within the warranty period, just give us a call, and we will ship you the necessary replacement parts via free ground shipping. The warranty does not cover normal wear and tear of the top surface. Free ground shipping only available for United States addresses. The Basic Wire Management Kit by UPLIFT Desk is at your service when you need just a little help tidying up the underside of your desk. This kit comes with enough cable ties to organize as many wires as you can throw at your desk. Plus, the cable coil organizer tool quickly wraps up your cords into a neat bundle. Raise and lower your UPLIFT Desk without worrying about loose wires getting in the way. The Advanced Wire Management Kit by UPLIFT Desk is a complete cable organization system for your height adjustable desk. We developed this kit after years of desk installations. Our main goal was to help you wrangle your cords to ensure that they don't get in the way of your desk moving up and down. It's a proven way to easily manage all computer and electric desk cords, while also tidying up the space underneath your desk. Keep your cords out of the way and off the floor with the Ultimate Wire Management Kit by UPLIFT Desk. This is the kit that will take your desk organization up a notch. It allows you to route your cords under your desk, protecting them while you raise and lower your standing desk. The Ultimate Wire Management Kit includes everything in the Basic Wire Management Kit, plus a 29-inch modesty panel. The modesty panel gives you a spacious mesh pouch in which to house cables at the rear of your desk, while also sheltering your legs from view. Gain control over cord clutter with the Magnetic Cable Organizing Channel by UPLIFT Desk. Measuring in at 14.5'' L by 2'' W by 1'' D, this cable management solution cleans up the jungle of cables known to hide out under many workspaces. The cable channel is fabricated from steel, and powder-coated in black, white, gray, or metallic (industrial style) to match your UPLIFT Desk Frame. The Magnetic Cable Organizing Channel attaches to any magnetic surface on your UPLIFT Frame, making setup a breeze. Route your cords through the channel's open slot, and worry no more about cables snagging as you move from seated to standing. Not all desks are created equal. If you're working with a larger desk setup and need to optimize space, the UPLIFT Height Adjustable Standing Desk with L-Shaped Custom Laminate Desktop is the heavy-duty workstation that's ready to handle just about anything, all while improving office ergonomics. Quick and quiet adjustments are made possible via the triple motor and triple leg design, giving you 530 pounds of lifting capacity for all of your sitting to standing transitions. A three-stage frame design stands above two-stage desks, and adjusts for height 33% faster, so you can get back to work. Enjoy 25.6" (650mm) of smooth height adjustments for better work on your level. Three legs give you more stability for larger or more complex desk situations, while the choice of laminate desktop color lets you pick the desk that complements your unique office style. Keep the desk but lose the dangerous chemicals! At Human Solution, we take the time and care to only use the most eco-friendly finishes and sealants to safeguard your L-Shaped Custom Laminate desk and office air quality for years of productive work. All UPLIFT Laminate desks are UV-cured, protected by a powder coat finish, and constructed with recycled wood composite core, making it qualify for LEED credits. Our laminate desktops are also GREENGUARD Certified, letting you improve your office ergonomics, sans harsh finishes. Accessorize yours with a large selection of ergo-friendly gear to maximize your comfort and productivity in one go. Organizational tools, monitor arms, keyboard trays, and a digital keypad elevate your desk for even better ergonomics, just build the perfect workstation for you and feel the difference an optimized standing desk can have on your work style. UPLIFT height adjustable desks meet or exceed all applicable section requirements of ANSI/BIFMA X5.5-2008 Desk Product Test Standards, which means that your desk conforms to the safety and durability requirements set forth by BIFMA. Download our test results here. The desktops you see on our builder have been selected for their popularity. If you are looking for a different Wilsonart laminate desktop, shop their whole collection and reach out to us for a custom quote for your desk! BIFMA/ANSI X5.5-2008 Certified Yes - completely meets all requirements of BIFMA/ANSI X5.5-2008 Test Sections 4.3, 4.5, 5.2-5.5, 6.0, 7.0, 8.0 & 15.0. Shipping dimensions This item must ship via freight carrier. Learn about freight shipping on our Freight Shipping 101 page. * Using the advanced 1-touch digital memory keypad is as simple as the push of a button. Four programmable buttons let you choose and set the best sitting and standing heights for you, even for multiple users. Or simply use the up/down buttons to get to that sit-to-stand sweet spot. I have the advanced keypad, and when I touch one of the presets my desk only moves a portion of an inch. Is there something wrong with my keypad? Odds are your memory presets are probably working just fine, you might just have an older control box. In order to recall your preset heights, you have to press and hold the memory setting until your desk reaches standing height. This is for safety, since the older UPLIFT 3-Leg Frame did not have the ability to sense an obstruction and stop. If you see the number 99.046.14.0070 printed on the sticker located near the power socket, then your control box is capable of one-touch memory preset function and may need to be reset - see our Programming Your UPLIFT Desk PDF for instructions on locking the keypad, changing the memory presets from one-touch to press-and-hold, and setting new lower or upper height limits. Are there any other Laminate colors available? Of course! Although we only list a few color choices on our site, we can have a laminate top made for you in any of the laminate colors available through Wilsonart Laminate. Shop their collection and let us know what you like to get the ball rolling on a custom quote for you. Can I have an ergo edge on these? The Custom L-Shaped Laminate Desktop has a curved corner, but it is not available with an ergo edge. The Ergo Edge is only available on our Eco Corner Desktop. Can I get these in other custom sizes that aren't listed? We do have the ability to customize the size and color of your laminate desktop. Call to speak to one of our Sales Pros for a quote on your custom laminate desk. Are laminate desktops softer than other types of desktop? Laminate material is not as rigid as bamboo or solid wood. However, we design all UPLIFT Desks with crossbar support under the desktop. As long as the crossbars are fully installed, any of our desktops should remain level and supported for the life of the desk. Does the desk ship fully assembled? Desks are shipped disassembled, but assembly is very straightforward. Watch our assembly video to see just how easy installation of your UPLIFT Desk will be. Do you make the tops yourselves? We use a local laminate manufacturer to custom make your desktop after you place your order. That is why the lead time on these desks is longer than the lead time on our other L-Shaped Laminate Desks. How do I clean my laminate top? Laminate is a very durable surface and can be wiped down with a damp, sudsy towel or a Lysol wipe. Do these tops genuinely match their dimensions listed on the website? Yes, the specifications table accurately lists the dimensions of the desk you will receive. Can I choose where the grommets go on my custom laminate top? Yes! If you would like to have your grommets placed elsewhere on your desktop, please reach out to our team by phone or by chat and our Sales Pros will be able to assist you. What is a laminate top? A laminate desktop is made from several different layers of material that are treated under high pressure to form a solid surface. The desktop is finished with a band to seal in the edges. Our custom laminate desktops are made from Wilsonart laminate. How are your desktops rated? Our laminate desktops are E-1-rated and feature 45 lb density particle board with a 3mm PVC edge. Is this desk suitable for activities other than your standard office fare? Yes, a corner desk is great for any activity where you need an ample amount of space and want to benefit from being able to stand from time to time. The UPLIFT Desk 3-leg Frame boasts a carrying capacity of 530 lbs, which means it can handle most of what you throw its way. Is the l-shaped desktop stable even though it comes in two pieces? The extension side attaches to the main side of the l-shaped desk with support brackets. There are two crossbars that also extend in an l-shape along the underside of the desktop. So even though your desktop comes in two pieces, these supportive measures combine to provide a very sturdy desk. Can I get a sample of the laminate before I purchase the desk to make sure that it matches with my office? Contact our Sales Team and they will be able to assist you in getting a sample of the Wilsonart laminate used to make the UPLIFT Custom Laminate L-Shaped Desk. How loud is this desk? Close your eyes and imagine the hum of your refrigerator or computer. The UPLIFT Desk Frame will emit 45 decibels of sound during motion, which will fall somewhere between these two appliances. Will I be able to assemble my desk alone? We recommend a two person assembly for the L-Shaped Laminate Desk. This desk is pretty heavy and you won't want to go at it alone! Laminate is an economical surface for a large, corner shaped desk. It comes in a wide variety of colors and can be customized to match your decor. The laminate surface features an antimicrobial finish to help cut down on the germs on your desktop. All in all, laminate is a very durable desk at a great price point. Why do I need a desk with a three-stage frame? Frankly, three-stage frames are just better. UPLIFT Desk frames are three-stage vs the traditional two-stage desk on the market today, which means their desks are 33% faster thanks to 3 spindles instead of 2. This means you have a greater range of adjustability, so desks fit shorter users and kids, all the way up to very tall users or those who plan on adding a treadmill to their setups later. How many motors does this desk come with? All UPLIFT Desks come with a motor in each leg, so in this case, three. This design makes UPLIFT Desks quieter to adjust, stronger and more reliable, and safer than desks that work with just a single motor. I live outside of the United States, will this desk work with my outlets and voltage? All desks and frames by UPLIFT Desk are designed to run on the US electricity standard of 120 volts. If you're ordering a desk from outside the United States (excluding Canada), you'll most likely need to plug your desk into a step down transformer, otherwise you run the risk of overloading your desk's control box, which is not covered by warranty. Just contact our support team if you have any questions. Is there an easy way to tell what version of control box I have? You bet! You can check to see which version of control box you have by glancing at the silver label on it. If that sticker says v4.1, v4.2, or v4.3, you have the newest version of UPLIFT Desk's control box, which means you have a few new features to enjoy on your desk. What are some of the features on the new control boxes? The latest version of UPLIFT Desk's control boxes comes with several exciting new safety features like Collision Sensitivity, Keypad Lockout, and the new ability to toggle between One-Touch and Constant-Touch modes, and switch between inches and centimeters with a few buttons. You can read about how to access these awesome new features on our blog post about the subject! How do I use the Keypad Lockout feature? In order to add an extra layer of safety to our desks, UPLIFT Desk designed their latest version 4.1 control boxes to be able to be locked so children and unwanted users cannot adjust it when this feature is turned on. To lock the keypad, press the "M" button for 5 seconds until the LED switches to "LOC", then press and hold the the "M" button to turn on the lockout feature. To unlock it, just press the "M" for 5 more seconds. This product comes standard with a 7-year limited warranty. $1,479.00 List Price: $2,495.00* The list price is the same as the MSRP (Manufacturer's Suggested Retail Price). It may not necessarily be the price at which the product is sold. 60x60 > 60" x 60" x 30"
We offer over 20 desktop materials, including Bamboo, Reclaimed Wood, Rubberwood, Solid Wood, GREENGUARD Laminate, Eco Curve, and more! Enjoy our multiple frame configurations; we have 2-leg, 3-leg, 4-leg and frame only options, as well.